December is almost upon us, which means its time to get your advent calendar ready to count down until Christmas. If you want to add some extra fun to your holiday, then you might want to skip out on buying an advent calendar. There are so many DIY calendars that you will have a blast making, which is certain to get you in the holiday spirit. On top of that, making your advent calendar might actually save you quite a bit of money. This is especially true if you need a calendar for more than one person. So, get a pencil and some paper out, because these ten ideas are certain to inspire you to make the advent calendar of your dreams without blowing your budget out of the water. Whether you’re buying your calendar or making it, using chocolate has become one of the most popular advent calendar themes. In fact, using chocolate in advent calendars has been passed down from generation to generation because this amazing dessert is one of the best treats, especially during hard times like the Great Depression. Generally, advent calendars you’ll find in stores will have characters made out of chocolate, but you can use all sorts of chocolate to make your calendar. If you’re looking to maximize savings, then you can easily fill up your calendar with Halloween candy. Another cheap option is to purchase a bulk bag of candy, so you have plenty of items to add to calendars. If you really want to put some work into your calendar, then use special molds to make characters. Chocolate is very easy to incorporate into just about any calendar design, so you can really show off your creativity here. Sometimes, the holidays can become a bit much. For many adults, a little alcohol is one of the best ways to help reduce the stress of the busy season. An alcoholic advent calendar doesn’t have to be as difficult to make as it sounds. First, you should start out the project by deciding what type of alcohol you will be using. One popular option is beer, especially if the calendar is being made as a gift. Of course, the craftsmanship for this calendar will take a little extra work. You will need a cylinder item to store each beer. A simple option is to raid your recycling bin for items like oatmeal containers. However, you can always go to a hardware store to find cardboard cylinders that will do the trick. Once you have your storage items then build around them. One fun option for this kind of calendar is to build a large gingerbread inspired house. You can make this out of wood or cardboard, but the design will easily be able to handle the larger storage areas. If you’d like to save money on the beer then try a mix and match deal at your local store, so you can keep the options fresh. You also don’t have to do a full 24 day calendar. Beer isn’t the only option though. If you prefer spirits, then get sample size bottles to place in each day’s slot. This will help keep the calendar smaller, but still desirable. Another fun option to consider for the ladies in your life is a makeup advent calendar. This is great for young girls, teens and adults so you can have a lot of fun customizing it. If you’re shopping for younger girls then you might opt for toy makeup, costume jewelry and lip balm, which can all be purchased at an expensive price. For adults and teens, consider grab bin items that can be used for special occasions or just for fun. You might also want to try your hand at making some makeup for the calendar. It is actually much easier than you probably expect, and you can make bulk batches so you can fill more than one calendar or use the extras as gifts and stocking stuffers. This year, it seems that socks are all the rage when it comes to advent calendars. You can find all sorts of fun characters available for purchase at a fair price. However, if you want to customize your calendar then socks are a great route to go. You can always make your own socks to make the calendar even more heartwarming. However, if you shop clearance socks then you can easily find character socks that suit everyone in your family. You might have to be on the look out all year though in order to make the calendar as exciting as you would like for each member of your family. You might also consider keeping this calendar a little shorter too, as too many socks might be overwhelming and expensive. This advent calendar will also keep some of the clothing items from going underneath the tree, which will probably make the kids happy. Not everyone has a huge sweet tooth, so instead of chocolate, you might consider adding snacks to the advent calendar. This can be a really easy option that adds an element of surprise to your daily routine. This advent calendar can be filled with snack sized chips, cookies, fruits, nuts and so much more. Your family’s favorite snacks are easy to pack into a wide variety of compartments, so you wouldn’t even have to worry about the snacks limiting the design of your advent calendar. You can even keep things simple by adding the snacks to little holiday inspired baggies with numbers. Kids that enjoy mysteries and puzzles will love to have a puzzle piece advent calendar. This calendar is certainly one that will help keep anticipation high as the month passes. This is probably one of the easiest advent calendars to make as you can place puzzle pieces in almost any container. You can also use just about any puzzle to accomplish this fun gift. For younger children, you might even consider printing out puzzle pieces that they can color, which is certain to help make things even more fun. On Christmas Eve, kids will have a full puzzle to put together, which should help cut down on their desire to open up gifts. You might even offer a special surprise to those that can guess what their puzzle is before they finish opening up each section of the calendar. Children will love receiving a few small toys before the holiday arrives. There are so many options you can choose from too, which will help make things even easier when setting up advent calendars for everyone. One of the easiest options is to purchase individually wrapped LEGO sets. You can separate the LEGOs to help save money or have a set or figure for each day of the calendar. Mystery bags are a huge hit this year too and are easy to place in a wide variety of calendars. Car fanatics will love receiving a toy car each day and if you buy these items in bulk you’ll spend very little. Of course, you can also find party favor toys at a cheap price in many stores. You can always mix and match the toys to suit each child, which is certain to make the month of December happier than ever. Instead of filling the advent calendar with possessions, you might want to think out of the box and come up with some activities to make the month even more enjoyable. For instance, you can come up with things the children like to do with you, like board games, picnics and an outing to the park. These free items can make up most of the chart and will help bond the family. Of course, you might add in a few gems like a chore free day or the dinner of your child’s choice. Another great option is to throw in a couple of treats like go out for ice cream or a trip to the movies. If you’re creating a calendar for a spouse then a massage, date night or favorite meal are always classic options. You might find that your activity calendar is cherished more than your calendars filled with tangible items. Reading can bring even more magic to the holidays, which is why a book advent calendar can truly add some fun to your celebration. Of course, books are a little hard to place in a calendar, unless you use a specific design. If you want to make your life easier, you can easily wrap the books and add a number to each one. You might be thinking that this calendar sounds a bit expensive, but you don’t have to use new books. Instead, you can shop thrift stores, used book stores or even use books you already have in the home. The key to this calendar is to have the family sit down and read a book each day. Your kids will love the bonding time and you’ll love the excitement it brings them without having to spend money. Use your sense of humor to add some fun to the holidays. One easy thing to do is to print out jokes to help bring a smile to each day of the month. You might also consider adding in a few riddles that will cause your children to stop and think for a little while. If you’re ready to for a little early gift giving, then you might offer a clue to one gift a day. If the child can crack the clue and find the gift in the home, then they can open it up. Another great way to help boost confidence is to add in a special message for each child that compliments them or thanks them for something they have done. Advent calendars truly are a lot of fun, which is why so many households have utilized them year after year. This year, you can skip purchasing your calendar at store, because these ideas are certain to bring more joy to the family. 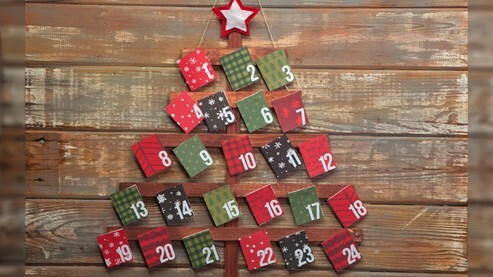 You might even make it a tradition to build a personalized advent calendar each year. The designs and treats are up to you, which will give you more control over the awe your family feels during this season.